Last night was opening night for The Time of Your Life, presented by the Theatrical Arts Society at Stony Brook. 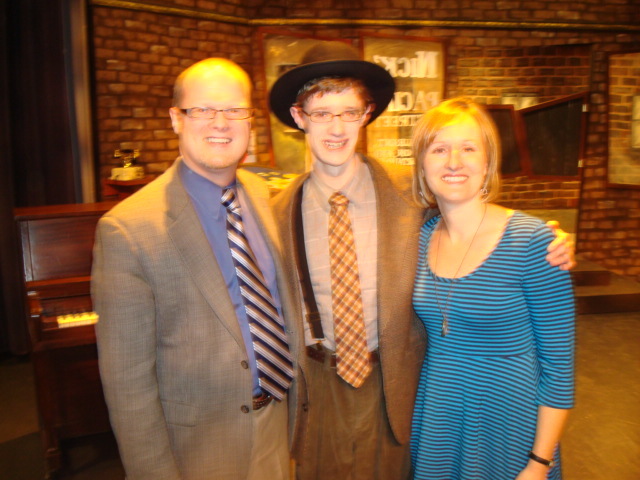 Jacob portrayed one of the characters in the play, Harry, and he did a great job. I had never heard of this play before. Written by William Sarayon and set in 1939 in San Francisco at a local “waterside dive,” the play is more a study in characters than it is an unfolding plot. I will see the play again on closing night and I am glad because there is a lot to digest. The main character, Joe, is enigmatic in many respects. He has money, but the audience is never told how he got his money. He uses his money to help other characters, but there is another layer to his character—one of sadness, anger, and disappointment. I left last night wondering about that other layer to Joe’s character. Unanswered questions are a large part of the play. As an audience, we aren’t supposed to know all the details. We only get to see the characters for this particular snapshot—hence, the title, The Time of Your Life. Harry (Jacob) is a wanna-be dancer and comedian who comes to the bar looking for work. In the weeks leading up to the production, I knew Jacob had to learn some dance steps for the play. I would see him doing foot-work in the house or hear him in his room. He really did a good job dancing while not making it look too good. It also explains why he has been so tired and complaining about his legs being sore—he is moving all the time when he is on stage! For those of us who are parents, I don’t think we ever tire of rooting for our kids and wanting them to succeed. I was certainly proud of Jacob last night, and grateful he had the opportunity to be a part of this production.